On September 6th, The CT Community Nonprofit Alliance, APT Foundation, Keep the Promise Coalition, Mental Health Connecticut and NAMI Connecticut partnered with BHECON to host a roundtable in West Haven, CT with state officials, legislators, candidates, community behavioral health advocates and constituents to discuss challenges and opportunities facing the state’s behavioral health system. 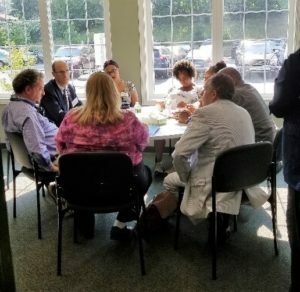 In total, 13 incumbents and candidates for State positions were on site at the APT foundation, a community mental health and substance use disorder provider, to take part in smaller roundtable discussions with community providers and advocates. These discussions were framed as a learning opportunity, to better engage policymakers in the realities of providing or receiving mental health and addiction treatment in the greater-New Haven area. Connecticut faces a myriad of challenges to meet the behavioral health needs of their constituents. Among them include a chronic underfunding of community-based services heightened by recent budgetary challenges. Providers stressed the need for state funding of behavioral health services and the difficulties around operating on grant funding that is not guaranteed year to year. Behavioral Health providers expressed how their business models are often tenuous at best, due to low reimbursement rates and lack of sustained funding, and they constantly worry about making ends meet. Data shows that over 52% of adults in Connecticut with a mental health concern cannot access services, due to many different barriers including cost and lack of providers or service availability. Another key barrier faced by individuals with private or commercial insurance in Connecticut is the lack of enforcement around federal mental health parity laws. Connecticut made progress this past legislative session in pushing forward parity enforcement policies but were unsuccessful in getting the new legislation passed. Legislators and advocates clarified that the proposed Connecticut parity laws would lay the groundwork for enforcing parity by collecting data and identifying areas for improvement to ensure access to mental health and addiction treatment is in line with federal statute. Lynn Madden, President and CEO of APT Foundation stated that when individuals receive treatment they, “not surprisingly, spend less time in emergency departments, they’re less of a burden on emergency responders, and they are less inclined to backlog the judicial system.” A clear message expressed by candidates and policymakers when convening the event was that budgets showcase priorities, and additional advocacy will be needed to ensure that behavioral health is made a priority next year.